At the time this was spoken live, I said to my husband, “Did you catch that?” Because in context, this little phrase was said as part of an 18 minute long talk. That phrase was one of those phrases that is so true it pierces you to the core. Pause and think about this quote. Just ponder on it a moment. I think this quote has many implications. Obviously it can be applied to religious faith. I think it can also be applied to faith in other things we have stewardship over. How about faith in parenting? Do you ever doubt something you have had success with or have seen success with? I think we have all been there! Sleep training, discipline methods, trudging through chores…we all have moments of doubt. Will this work? Is the effort worth it? Should we even bother? The obvious caveat here is that parenting methodology is seldom “doctrine.” There are things the Lord has said in respect to parenting, but in large manner we are left to make our own best judgement calls. There is no manual and no one right way to parent–not for a family in general and not for each individual child within that family. So yes, there will be times you make mistakes. Sometimes things that worked for one child will not work for another. Sometimes you will find things don’t actually jive with your family. But if you are a prayerful person and you frequently ponder and pray over how to best parent your child, you will be guided by the Lord in what to do for that child. 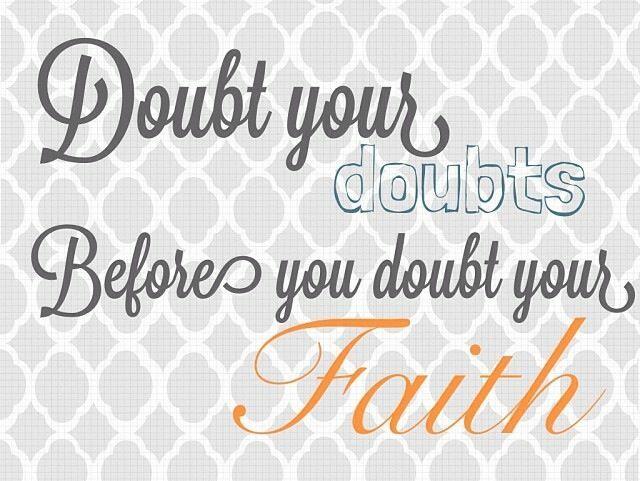 As you move forward on what the Lord has told and inspired you for that child, doubt your doubts before you doubt your faith. Trust in the Lord. And once you see your miracles, continue in the faith of what you have done rather than casting your eyes about looking for other explanations. Doubt not, fear not.